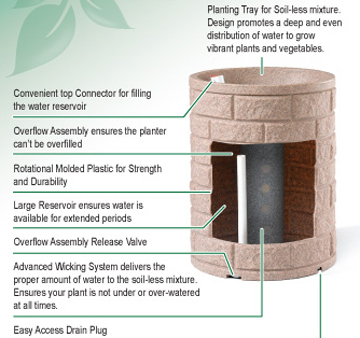 Self Watering polymer resin rotationally molded polymer rolled rimed planters "Rapid Wick" watering system delivers the water and nutrients your plants need, automatically. 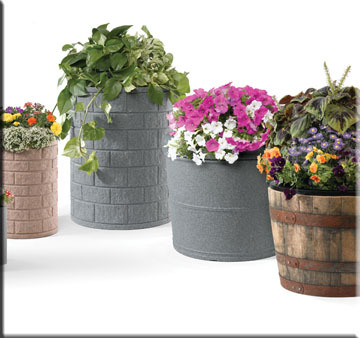 Barrel Vase Planters are embedded with Algaecide and UV Inhibitors to protect against algae build up and sun fade. 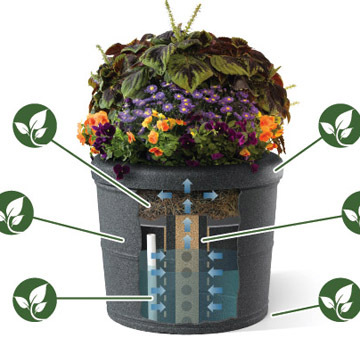 Automatic watering round vase planters come in three sizes. Virtually indestructible, architectural grade rotationally molded designer polymer resin. 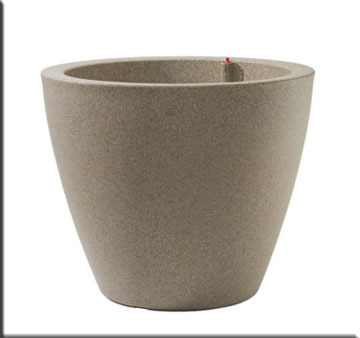 Self watering planters are UV protected from sun light and have a Rapid wick watering system. Rapid Wick sub irrigation watering system automatically adjusts water flow rate as moisture demands change due to ambient conditions (Sun, Wind, Rain, Humidity, etc.). This classic design fits beautifully into every landscape. Available in 6 molded through colors embedded with Algaecide and UV Inhibitors to protect against algae build up and sun fade. These planters will not chip, crack or fade. 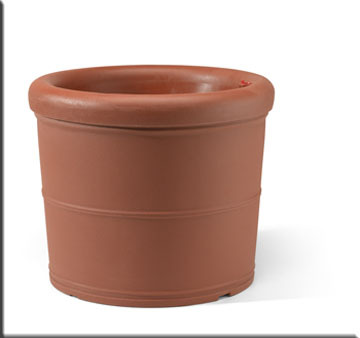 Armeria self watering polymer containers can handle delivery of water and nutrients to your plants for weeks, even months based on environmental weather conditions. 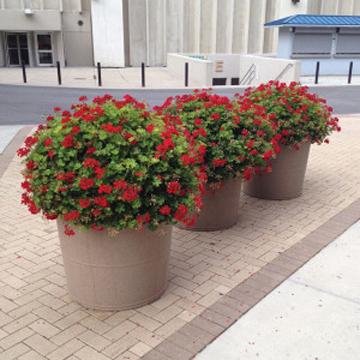 Landscape architects, shopping centers, contract landscapers, and Non-profit organizations have specified our planters for their parks, colleges and universities, and commercial buildings for over 10 years. The wick has the ability to automatically adjust water flow rate to the plant roots as moisture demands change. This ensures the proper amount of water is delivered to the root system at all times. The overflow assembly assures planter can not be overfilled. Planters have an easy access drain plug for winterizing.